Config File Management icon has wrong SRC address, and all sections headers misses description. 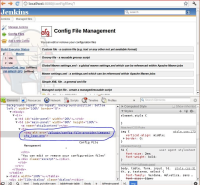 "Managed script file - create a managed/reusable script"
See attached file jenkins_Config_File_Management_broken_icon_and_missing_descriptions.JPG . Config File Provider Plugin version 2.0. Note: in the attached files configfiles_ci_localhost_inspection.JPG and configfiles_ci_localhost.JPG , the actual view is the left screen with 'localhost' address. see icon and sections headers. Dominik Bartholdi added a comment - 2012-06-29 05:04 Is this still an issue?